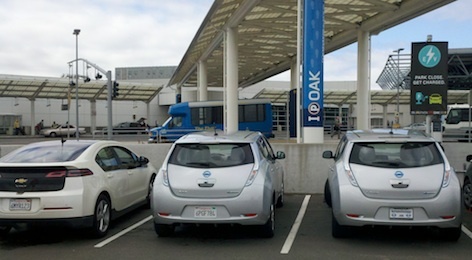 I silently guided my Nissan LEAF into space 14 reserved for electric cars at the Oakland International Airport (OAK). Already plugged in to other spaces were Chevrolet Volts, Tesla Roadsters, a converted Prius plug-in hybrid, and a Mitsubishi i-MiEV. Supporting the 15 preferred parking spaces were eight Coulomb ChargePoint Dual Level 2/1 Charging Stations, each capable of charging two vehicles. These bollard models support one Level 2 charge (240VAC/30A) with SAE J1772 communications and the new 5-pin standard connector, and one Level 1 (120VAC/16A). I held my ChargePoint card near the RFID reader, the connector released, I plugged-in and started charging. In the space next to me was the converted Prius using the Level 1 outlet. I had traveled 28 miles. When I left two hours later I was fully charged. The man with the biggest smile at the event was Richard Lowenthal plugging-in his Chevrolet Volt. Coulomb now has over 4,000 charge points operating in 14 countries supported with web-based solutions including internet portals, smart apps, and telephone support. Oakland Airport is the latest and one of the biggest Coulomb customers. Lowenthal is founder and CTO of Coulomb Technologies. Last time I had seen him he was driving the MiniE, now used by a colleague at work. He is logging up miles so fast crisscrossing California, that his new plug-in hybrid has made his life easier. He also has a Fisker Karma on order, but Karma deliveries continue to slip and he has yet to be given a test drive. 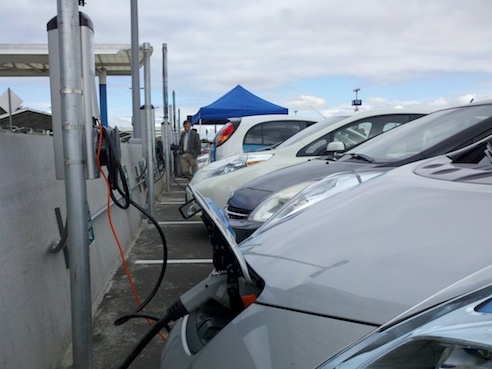 OAK is part of the Port of Oakland, which implements more sustainable projects each month, with these 15 electric car charging stations being the latest. Because it is its own utility OAK can implement these projects faster. The 8 dual chargers are supported by a 480V / 90A Square D Transformer which is supported by a modern sub-station. OAK has 756 kilowatts of solar power. A major airport tenant, FedEx took me on a tour that included standing on their roof covered with almost a megawatt of solar PV. Now FedEx is adding five 100 kW Bloom Energy fuel cells that efficiently use natural gas. OAK is the first airport to have a LEED Silver passenger terminal and is already installing LED lighting. The new control tower is LEED Gold and will utilize geothermal heating and cooling. 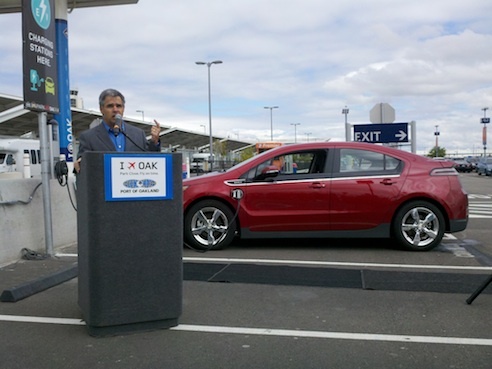 OAK operates a public CNG fueling station used by taxis, airport parking shuttle fleets, BART buses, government vehicles and personal CNG vehicles. In 2014, BART will offer an electric and automated driverless connector trains to the airport. Commercial planes currently use massive engines burning jet fuel, a major source of greenhouse gases and emissions that affect health. Airports, including OAK, have no control over plane design or fuel required. What OAK does better than most airports is create alternatives so that when planes are on the ground, jet engines do not need to run to provide auxiliary power. Working with Southwest Airlines and other operators, planes in gates have access to 480V electric power and terminal provided air conditioning to run all auxiliaries with engines off. If you’ve ever boarded a plane sweltering with heat, you can understand the benefit. At its regional hub at Oakland, FedEx also provides electric auxiliary power for up to 100 planes daily that unload and load packages for sorting and delivery. The ground service equipment (GSE) for Southwest and other carriers is increasingly electrified. Oakland International Airport is in Alameda County who’s AC Transit has the nations most heavily used fleet of electric buses. Its 12 hydrogen fuel cell buses carry thousands each day. The County fleet includes 11 electric Ford Transit Connects and 79 Nissan LEAFs. The next time visitors fly to see us, I will be parked across the street from baggage claim, charging my Nissan LEAF. When we leave it will be fully charged for their electric tour of the Bay Area. Great article John! It’s quite impressive how much OAK has invested into lowering GHGs. It would be great to read how much less energy and GHG’s these efforts have made. Ralph: Since OAK has a solar array AND EVSE, there’s a fair chance that electrons generated from the array will charge up your car. Does Coulomb have any solar powered chargers in the works? An electric cars parking fees should be reduced or waived because of no pollution (carbon monoxide or noise) to the immediate area. I’m glad that :OAK put the charging units up front and visible for everyone to see. Once the electric charging stations are in front of Walmart (and other public spaces) you’ll see a positive change in the perception about the viability of owning an electric car.